The Stinking Truth About Garbage greets children and visitors with an educational and engaging exploration into environmental issues. 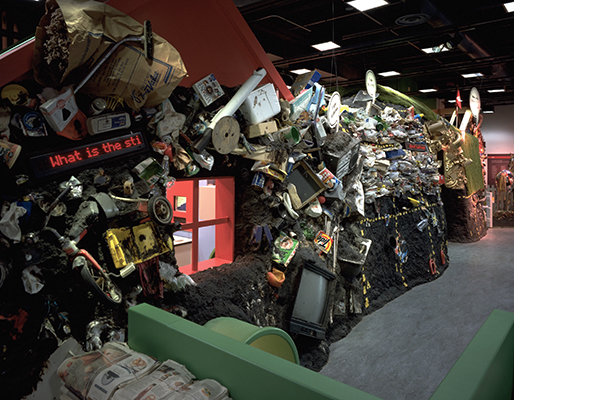 Located in a prominent location, the exhibition is a colorful, simulated landfill. 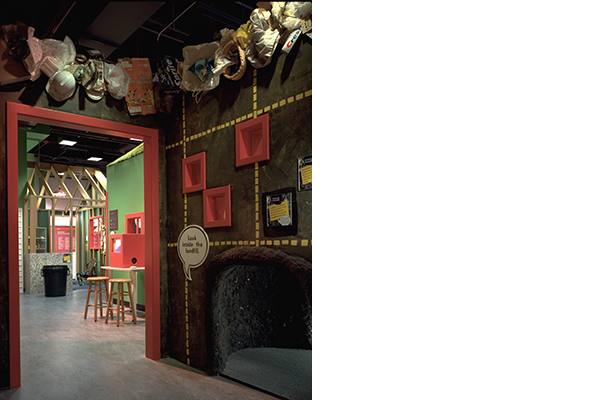 Via stimulating imagery and interactive elements, this environment teaches visitors about problems associated with disposal of solid waste, and introduces practical solutions that can be studied within the exhibit and practiced at home. Two families with contrasting attitudes to the environment form the content while constructing the multi-sensorial space. 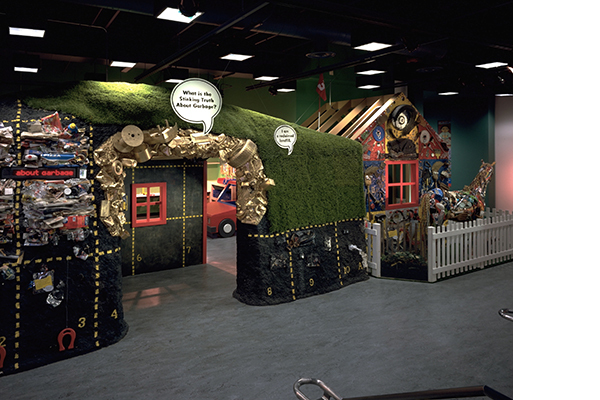 Each family’s house is a small pavilion, representative of a typical home with imagery taken from a child’s perspective. Belongings and details contrast the habits of the two families: the Green Family recycles and Waste-A-Lots don’t. The two homes are physically and symbolically tied together via a transitional volume of garbage that makes a metamorphosis from dump to sanitary landfill to reclaimed landfill (a.k.a. golf course). These iconographic elements identify the conceptual basis of the exhibit and provide an architecturally unconventional spatial environment for exploration. The exhibit is itself a huge piece of recycled art and architecture, constructed from trash and treasure. The folk-art façade of reclaimed possessions is fanciful and informative, covered in smiling brooms, vinyl record albums, and past bits and pieces of early technologies. 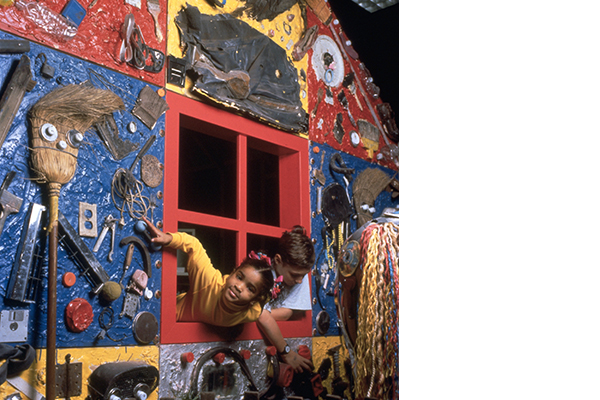 Children turn trash into treasure as they make art in the exhibit’s Re-Creation Station. 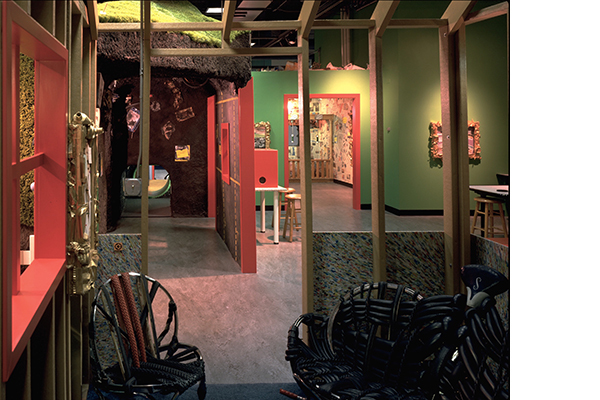 To test their newfound environmental knowledge, children play the interactive computer program, illustrated and developed alongside the exhibit. Young visitors and their families learn to reduce, reuse, and recreate while they discover the Stinking Truth About Garbage. 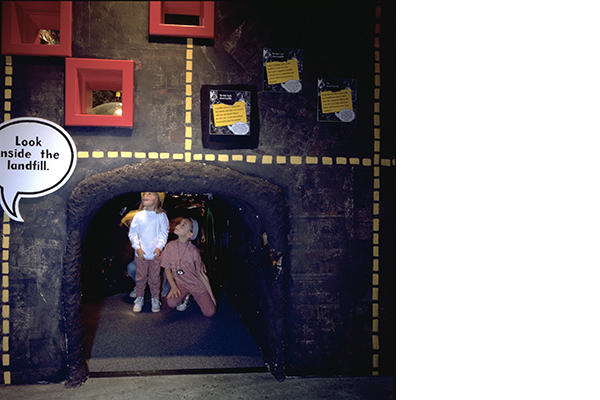 Exhibit Design: Architecture Is Fun, Inc.